On May 30, 1935, the greatest career in the history of major league baseball came to an end. It was Memorial Day in Philadelphia, but there were no fireworks to bid farewell, just a weak ground ball to Phillies’ first baseman Dolph Camilli and a mournful walk back to the dugout. The immortal Babe Ruth was finished. Ruth, pictured here with long-time Yankees’ teammate Lou Gehrig, finished his career as a member of the Boston Braves. At the time, no one knew they had seen the last of the Bambino. After the Memorial Day loss to the Phillies, Ruth, who had been nursing a sore knee for most of the season, decided that he needed some time to rest. 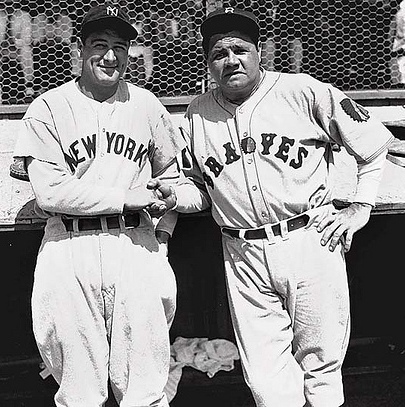 So, during the next series against the Giants, the Babe put on a suit instead of a uniform and watched his Boston Braves’ teammates lose two of the next three. An idle Ruth was of no use to the Braves, however, so a confrontation was inevitable. Ruth’s return to Boston was precipitated by a disagreement between the legendary slugger and Yankees owner Colonel Jacob Ruppert and chief executive Ed Barrow. Following the 1934 season, the team’s second straight campaign without a pennant, Ruth all but demanded that the Yankees’ brass fire manager Joe McCarthy. Ruppert and Barrow refused, so Ruth angrily declared that he’d never play for them again. It was an unfortunate threat because that suited the Yankees just fine. Instead of having to make what would have been an incredibly unpopular decision, the temperamental Ruth had gone ahead and done it for them. 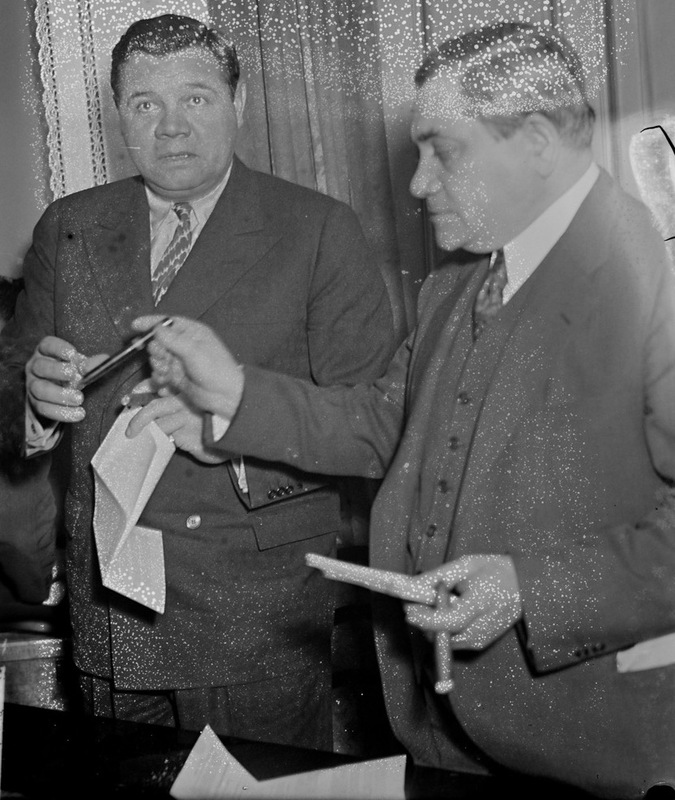 While Ruth was abroad on a trip around the world, Judge Emil Fuchs approached Colonel Ruppert about having the Bambino return to Boston to play for his Braves. Fuchs desperately needed a gate attraction for his woeful team, and Ruppert was eager to get rid of the increasingly troublesome slugger. So, the two owners hatched a plan to ensure a smooth transfer. In addition to a 25,000 salary, Fuchs offered Ruth a laundry list of hollow inducements, including an implied opportunity to manage. In response, Ruppert feigned surprise and agreed to not stand in Ruth’s way. Finally, on February 26, 1935, the three men held a press conference to announce that Babe Ruth was now a member of the Boston Braves. Judge Fuchs hands Ruth a pen so he can sign his new contract with the Braves. At first, it seemed like the move might revitalize both the aging Ruth and the financially strapped Braves’ franchise. During spring training, the team played to large crowds as it barnstormed up north, and then on Opening Day, 25,000 people jammed Braves Field to watch the Sultan of Swat take Carl Hubbell deep in a 4-2 victory over the New York Giants. However, that initial euphoria would quickly give way to acrimony as a developing contentious relationship between Ruth and Fuchs came to a head just after Memorial Day. After getting off to a hot start in the first five games of the season, Ruth suffered through a nightmarish 17-game stretch in which he hit .068 with only one home run in 57 plate appearances. What’s worse, the hobbled and overweight Ruth could barely field his position, subjecting the once invincible figure to jeers, laughter and, worst of all, pity. In the middle of that horrendous stretch, Ruth finally decided to call it quits, but Fuchs, who was desperate to squeeze as many gates as possible out his sideshow attraction, convinced him to stick around for at least the upcoming road trip, which was to feature a Babe Ruth Day in all five cities on the tour. As Ruth struggled through sickness, injury and the rapid decline of his skill, he also gradually came to realize that all of Fuchs’ promises were empty. Because the Braves were in such poor economic condition, it soon became apparent that the financial inducements in his contract were worthless. However, what bothered Ruth most was the realization that he would never be given a chance to manage. During what was the darkest period of his brilliant career, Ruth did have one more shining moment. On May 25 in Pittsburgh, the Babe reprised his role as the Sultan of Swat by belting three home runs in one game for the second time in his career. The outburst was Ruth’s final gasp as a great player because the four hits he had that day turned out to be his last. After Ruth pulled up lame in the Memorial Day loss to the Phillies, he asked the Braves for a leave of absence so he could attend a gala celebration in New York welcoming the new French ocean liner Normandie to the city. Considered to be the biggest, fastest and most luxurious ship in the world, the Normandie was the Babe Ruth of ocean liners, so it only made sense that the Bambino be there to greet it. Unfortunately, Judge Fuchs didn’t agree. After his request to leave the ballclub was denied, Ruth announced his intention to join the voluntarily retired list. When word filtered through the press, Judge Fuchs responded by granting Ruth his unconditional release. According to most reports, the two sides were inexorably headed for a divorce anyway, but the row over the Normandie proved to be the last straw. 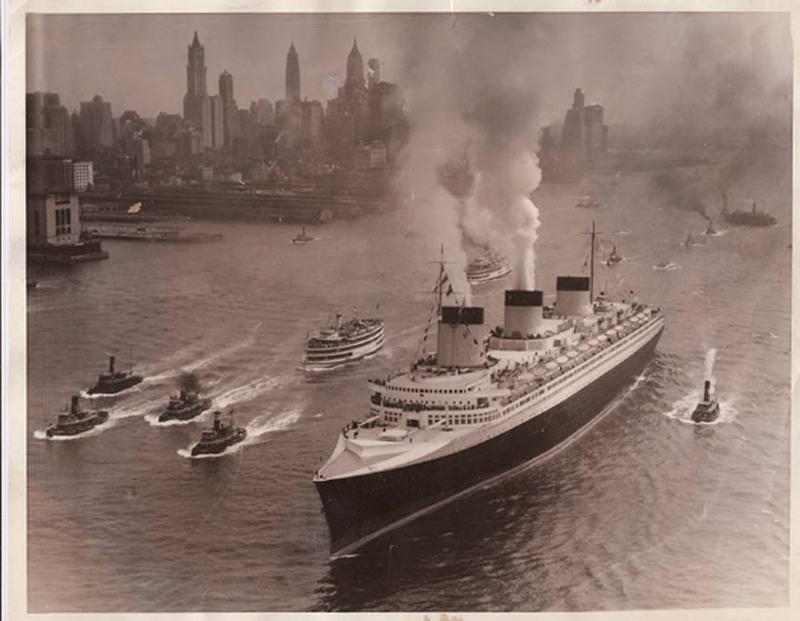 The Normandie arrives in New York on her maiden voyage. The renowned French luxury liner was the Babe Ruth of the sea. Although Ruth left Boston with the intention of playing again once his knee had recovered, there would be no more offers for his services. Fuchs also didn’t last much longer in Boston. By the end of the season, his financial woes finally caught up with him when the National League was forced to assume control of the Braves. Even the glory days of the Normandie were fleeting. Less than one year after its launch, the British Queen Mary had supplanted the French ship as the world’s marquee ocean vessel, and then in 1942, when France fell to the Axis powers, the luxury liner was seized by the United States and converted into a troop transporter. However, during the conversion process, the once proud vessel caught fire, capsized and sunk to the bottom of the Hudson River. After efforts to repair the ship were abandoned, the decision to sell it for scrap was made in October 1946. While the Normandie was being dismantled, so too was Ruth’s last hope of ever becoming a manager. Earlier in 1946, the Babe reached out to Larry MacPhail, one of the new owners of the Yankees, about managing in the team’s minor league system. His request was denied. Then, when he inquired about any job with the team, MacPhail wrote back suggesting he work with youth baseball programs. In other words, the Yankees no longer had any use for the man who was so instrumental in building the team’s brand and establishing it legacy. Unfortunately, the news that came in November 1946 was even worse. Ruth was diagnosed with cancer. On August 16, 1948, the Babe finally lost his battle with the disease, and all of baseball mourned. Ever since then, however, the game has celebrated his epic career. How fitting then that it all came to an end on Memorial Day. Although there were no pomp and circumstance to mark his last at bat, the long career that preceded it remains the game’s ultimate memorial to greatness.